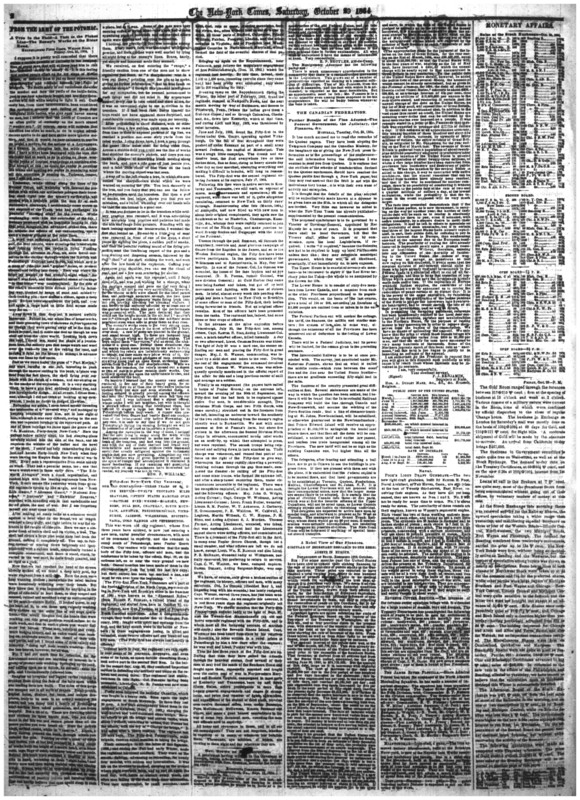 Source: New-York Times 29 October 1864: 2. Our transcription is based on a digital image of a microfilm copy of an original issue. For a description of the editorial rationale behind our treatment of the journalism, see our statement of editorial policy. Editorial note: This piece is unsigned. Emory Holloway first identified Whitman as the author of this piece in The Uncollected Poetry and Prose of Walt Whitman (Garden City, NY: Doubleday, Page & Co., 1921), 2:37–41. Additionally, the Charles E. Feinberg Collection at the Library of Congress contains a fairly polished draft of the first portion of the article, written in Whitman's hand (loc.00929). The Beinecke Rare Book and Manuscript Library at Yale University also holds several manuscripts in Whitman's hand that contain notes that directly contributed to this piece (yal.00185, yal.00211, and yal.00172). Information about and images of these manuscripts can be found in the Archive's Integrated Catalog of Whitman's Literary Manuscripts. Cite this page: Whitman, Walt. "Fifty-first New-York City Veterans." 29 October 1864. The Walt Whitman Archive. Gen. ed. Ed Folsom and Kenneth M. Price. Accessed 18 April 2019. <http://www.whitmanarchive.org>. OUR OLD COMPANIONS—THREE YEARS OF GENUINE SERVICE—TWELVE THOUSAND MILES TRAVELED, FIFTEEN STATES MARCHED OVER—BATTLES EVERYWHERE—ROANOKE, NEWBERN, BULL RUN, CHANTILLY, SOUTH MOUNTAIN, ANTIETAM, FREDERICKSBURGH, VICKSBURGH, JACKSON, WILDERNESS, SPOTTSYLVANIA, COLD HARBOR AND PETERSBURGH. This war-worn old city regiment, whose first three years have expired, is now just entering a new term, under peculiar circumstances, with most of its command in captivity, and the remnant in camp south of Petersburgh,1 near Poplar Grove Church.2 Our readers will remember that the main body of the Fifty-first, officers and men, had the misfortune to be taken by the rebels, Sept. 30, on the extreme left, on or near the very ground we now hold. Casual mention has been made of them in the correspondence from the front the last few days; but their career has been too marked a one, and must be run over from the beginning. Pretty soon followed the battle of Chantilly, which was fought in a heavy rain.9 Soon again the night engagement at South Mountain. In these they lost 35 men. A few days subsequently found them in the thickest at Antietam, (Sept. 17, 1862,) charging the well-known and hard-contested stone bridge.10 Several efforts to get the bridge had proved futile, when about 1 o'clock, according to orders, Col. POTTER led the attack, with the cry of "Charge the bridge." It was taken after a sharp conflict. The regiment lost 100 men here. The Fifty-first Pennsylvania, same brigade, deserve equal mention in taking the bridge. Their campaign in all the latter of this Summer, (1862,) and during the Fall and early Winter, made the regiment hardened soldiers. They were on the march, fighting, advancing or retreating, for nearly four months, with seldom any intermission. It was life on the bivouac in earnest, sleeping on the ground where night overtook them, and up and on again the next day, with battle or pursuit every week, and often men falling by the road from utter exhaustion. Thus they promenaded, by rapid marches, amid heat, dust, rain or snow, crossing mountains, fording rivers, &c., often without food to eat or water to drink, all those parts of Stafford, Culpepper, Prince William, Fairfax, Fauquier, Loudon, and the other counties in Virginia; and of Frederick and Washington Counties in Northwestern Maryland, which formed the field of the eventful contest of that period. Bringing up again on the Rappahannock, near Falmouth, next follows the sanguinary engagement of first Fredericksburgh, (Dec. 13, 1862,) where the regiment lost heavily.11 By this time, indeed, their 1,100 to 1,200 men, (counting recruits since they came out,) had been pretty well exhausted; only about 150 to 200 remaining for duty. Breaking camp on the Rappahannock during the Winter, the latter part of February, 1863, found the regiment camped at Newport's News, and the next month moving by way of Baltimore, and thence to Pittsburgh, Penn., (where the ladies gave them a first-rate dinner,) and so through Columbus, Cincinnati, &c., down into Kentucky, which at that time, and during April and May, 1863, was threatened by rebel invasion. June and July, 1863, found the Fifty-first in the forces under Gen. GRANT,12 operating against Vicksburgh.13 On the fall of that stronghold they were pushed off under SHERMAN14 as part of a small army toward Jackson, the capital of Mississippi. This was a tough little campaign.15 The drouth and excessive heat, the dust everywhere two or three inches thick, fine as flour, rising in heavy clouds day after day as they marched, obscuring everything and making it difficult to breathe, will long be remembered. The Fifty-first was the second regiment entering Jackson at its capture, July 17, 1863. Following this they were in active service in Kentucky and Tennessee, (we still omit, on account of space, many movements and operations,) till the regiment, what there was left of it, quite altogether reenlisting, returned to New-York on thirty days' furlough. Rendezvousing after this (March, 1864,) at Annapolis, and now filled up with new men to about their original complement, they again saw the Southwest as far as Nashville, Chattanooga, Knoxville; &c., whence they were rapidly returned to join the rest of the Ninth Corps, and make junction toward Brandy Station16 and Culpepper17 with the Army of the Potomac. Thence through the past Summer, all through the sanguinary, resolute and most glorious campaign of GRANT from the Rapidan to the James, and so to the Weldon Railroad region, the Fifty-first have been active participants. In the mortal contests of the Wilderness18 and at Spottsylvania,19 in May, they lost heavily. In one of the former, Col. LE GENDRE20 was wounded, the bones of the face broken and an eye destroyed. (R. B. POTTER, former Colonel, was now division General.) At Cold Harbor they came near being flanked and taken, but got off by bold movements and fighting, with the loss of sixteen men. In brief, almost every week this pending campaign has seen a funeral in New-York or Brooklyn of some officer or man of the Fifty-first, their bodies being forwarded to friends. Not an original officer remains. Most of the officers have been promoted from the ranks. The regiment has, indeed, had some three or four crops of officers. Finally in an engagement (the papers have called it battle of Poplar Grove,) on the extreme left, toward the evening of the 30th of September, the Fifty-first had the bad luck to be captured almost entire.23 Our men, in considerable strength, (two divisions Ninth Corps, and two Fifth Corps, with some cavalry,) stretched out in the forenoon from the left, intending an endeavor toward the southerly of the two railroads running from the enemy's region directly west to Burkesville. We met with some success at first at PEEBLE'S farm,24 but about five o'clock in the afternoon the Second Division Ninth Corps in advance, encountered strong rebel works on an acclivity, up which they attempted to press, but were repulsed. The secesh troops being reinforced and sallying down in turn attacked us. Their charge was vehement, and caused that part of our force on the right of the Fifty-first to give way, whereupon the enemy rapidly throwing a powerful flanking column through the gap thus made, completed the disaster by cutting off the Fifty-first and some other troops, who formed the extreme left, and after a sharp tussel capturing them, under circumstances honorable to the regiment. There were ten companies captured, of from 30 to 40 men each, and the following officers: Maj. John G. Wright, Acting Colonel; Capt. George W. Whitman, Acting Lieutenant-Colonel; Lieut. Frank Butler, wounded; Lieuts. S. M. Pooley, W. T. Ackerson, J. Carberry, H. Groenomeyer, F. E. Waldron, W. Caldwell, J. Loghran, Martin Witbeck, C. W. Hoyme, P. H. Sims, and Acting Adjutant S. J. Murden. Thomas Farmer, Acting Lieutenant, wounded, was taken, but was exchanged. About half the Lieutenants named above were acting officers, not commissioned. There is a remnant of the Fifty-first still in the field, in camp near Poplar Grove Church, though but a small number, and what officers are left we do not know, except Lieut. WM. E. BABCOCK and also Lieut. F. B. MCREADY, wounded badly at Wilderness, partially recovered, but preferring to return to service. Capt. C. W. WALTON, we hear, escaped capture. DANIEL DELAMY, Acting Sergeant-Major, was captured. Thus the first three years of the Fifty-first are up. During that time they have sailed the Atlantic through the heaviest storms, (lost several of their men at sea) trod the sands of the Southern Coast and fought upon them, repeatedly marched and fought over the entire seat of war in Northwestern Maryland and Eastern Virginia, campaigned in most parts of Kentucky and Tennessee, been up and down fifteen States, active participants in more than twenty general engagements and sieges of strongholds, and twice that number of fights, skirmishes, and expeditions of the second or third class, traveled over twelve thousand miles, been under BURNSIDE, POPE, MCCLELLAN, MCDOWELL, MEADE, SHERMAN and GRANT, and made a good honest expenditure in the war of some two thousand men, counting the men and officers now in captivity. All honor and reverence to these, and to all our old campaigners! They are not forgotten, whether in captivity or in camp, or whatever has befallen them. Thousands, aye millions, of hearts, are turning to them night and day wherever they are.